From Afghanistan to Zimbabwe, search giant Google has online presence in over 180 countries, including Bhutan's long-time football rival, tiny Montserrat at google.ms. Thus, the obvious question: Isn't it prime time for www.google.bt? Surprisingly, the domain is currently available for purchase, arguably one of the last Google domains still not taken. Yes, I know: International companies have to pay a hefty Nu 3,000 per year (around US$70) to register a .bt domain ("exclusive of bank transfer charges"), but with Google's last year's revenue at around Nu 1.3 trillion (! ), I have a gut feeling the company can afford this lavish expense. 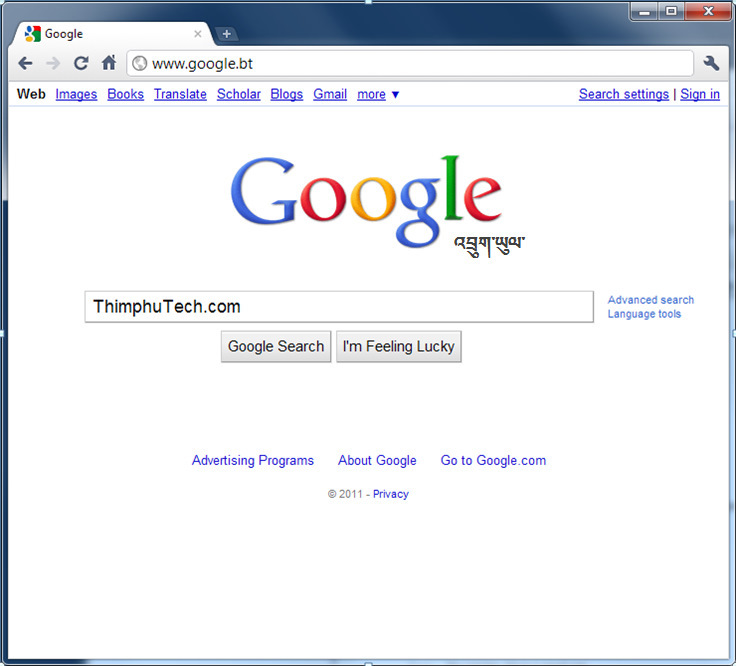 Does anyone know why google.bt is unavailable outside of Bhutan? It is such a pity. I would like to find some Dzongkha-language websites, maybe forums or blogs, but I have no idea how can I do it.